UCLA researchers have genetically engineered tomatoes to produce a peptide that mimics the actions of good cholesterol when consumed. 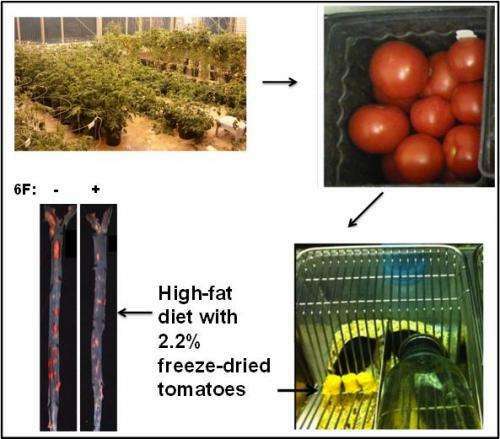 Published in the April issue of the Journal of Lipid Research and featured on the cover, their early study found that mice that were fed these tomatoes in freeze-dried, ground form had less inflammation and plaque build-up in their arteries. "This is one of the first examples of a peptide that acts like the main protein in good cholesterol and can be delivered by simply eating the plant," said senior author Dr. Alan M. Fogelman, executive chair of the department of medicine and director of the atherosclerosis research unit at the David Geffen School of Medicine at UCLA. "There was no need to isolate or purify the peptide—it was fully active after the plant was eaten." After the tomatoes were eaten, the peptide surprisingly was found to be active in the small intestine but not in the blood, suggesting that targeting the small intestine may be a new strategy to prevent diet-induced atherosclerosis, the plaque-based disease of the arteries that can lead to heart attacks and strokes. Specifically for the study, the team genetically engineered tomatoes to produce 6F, a small peptide that mimics the action of apoA-1, the chief protein in high-density lipoprotein (HDL or "good" cholesterol). Scientists fed the tomatoes to mice that lacked the ability to remove low-density lipoprotein (LDL or "bad" cholesterol) from their blood and readily developed inflammation and atherosclerosis when consuming a high-fat diet. The researchers found that mice that ate the peptide-enhanced tomatoes, which accounted for 2.2 percent of their Western-style, high-fat diet, had significantly lower levels of inflammation; higher paraoxonase activity, an antioxidant enzyme associated with good cholesterol; higher levels of good cholesterol; decreased lysophosphatidic acid, a tumor- promoter that accelerates plaque build-up in the arteries in animal models; and less atherosclerotic plaque. Several hours after the mice finished eating, the intact peptide was found in the small intestine, but no intact peptide was found in the blood. According to researchers, this strongly suggests that the peptide acted in the small intestine and was then degraded to natural amino acids before being absorbed into the blood, as is the case with the other peptides and proteins in the tomato. "It seems likely that the mechanism of action of the peptide-enhanced tomatoes involves altering lipid metabolism in the intestine, which positively impacts cholesterol," said the study's corresponding author, Srinavasa T. Reddy, a UCLA professor of medicine and of molecular and medical pharmacology. Previous studies performed by Fogelman's lab and other researchers around the world in animal models of disease have suggested that a large number of conditions with an inflammatory component—not just atherosclerosis—might benefit from treatment with an apoA-1 mimetic peptide, including Alzheimer's disease, ovarian and colon cancer, diabetes, asthma, and other disorders. The immune system normally triggers an inflammatory response to an acute event such as injury or infection, which is part of the natural course of healing. But with many chronic diseases, inflammation becomes an abnormal, ongoing process with long-lasting deleterious effects in the body. If the work in animal models applies to humans, said Fogelman, who is also the Castera Professor of Medicine at UCLA, consuming forms of genetically modified foods that contain apoA-1–related peptides could potentially help improve these conditions. The peptide would be considered a drug if given by injection or in a purified pill form, but when it is a part of the fruit of a plant, it may be no different from a safety standpoint than the food in which it is contained—and it may be better tolerated than a drug, Fogelman said. He noted that one possibility could be the development of the peptide into a nutritional supplement. The current study and findings resulted from years of detective work in searching for an apoA-1 peptide that could be practically produced. Peptides prior to the current 6F version have required additions that can only be made by chemical synthesis. The 6F peptide does not require these additions and can therefore be produced by genetically engineering plants. The team chose a fruit—the tomato—that could be eaten without requiring cooking that might break down the peptide. The researchers were able to successfully genetically express the peptide in tomato plants, and the ripened fruit was then freeze-dried and ground into powder for use in the study. "This is one of the first examples in translational research using an edible plant as a delivery vehicle for a new approach to cholesterol," said Judith Gasson, a professor of medicine and biological chemistry, director of UCLA's Jonsson Comprehensive Cancer Center and senior associate dean for research at the Geffen School of Medicine. "We will be closely watching this novel research to see if these early studies lead to human trials." In addition, Gasson noted that this early finding and future studies may yield important and fundamental knowledge about the role of the intestine in diet-induced inflammation and atherosclerosis. We do not need to modify a healthy vegetable to cause it to be a drug delivery system which can be used to deliver unapproved chemicals to human brings. Having made billions from cholesterol modifying drugs, the drug companies cannot stop creating dangerous and unnecessary cholesterol drugs and delivery systems. Distribute these tomatoes to the food industry immediately; Especially the burger chains, where it's needed most. I could agree with it in full extent. In addition, the genetic manipulations are in very early state of their development yet: they result into fancy spectrum of various proteins and RNA molecule residua, many of them are coming from viral vectors used. It's a technology, which essentially works already, but its result is just a metabolic mess. From this reason the animals (who are more sensitive to the quality of food) often refuse to consume the GMO products - they simply taste suspiciously for them. Now we are facing the situation, when the biochemists are trying to develop the solutions, which should compensate the unhealthy effects of numerous chemicals and food additives, developed with another chemists and researchers. In this way, the lobby of researchers is doing the money with healing of people from its own products and the chain of money is closed. Not to say, that the unhealthy character of burgers comes mostly from saturated fat acids in palm oil, the production of which contributes to deforestation, droughts and extinction of animals (like the orangutans). If you succeed in hiding the total cost of ownership, you can sell whatever technology you want and the people will be ever thankful for it. The principle of free-market society is to force the people in spending of money for cheap products and to dissipate the hidden cost of these savings in another areas. So if the chemists develop the cheap food technology, which is toxic from long-term perspective, they're just cheating the people and their government with promise of saving of money, which must be spent anyway for health-care later. Such a people are just dissolving their expenses in another areas of economy in this way - such a "saving" is indeed not a saving at all. But the free market economy can operate with atemporal current prices only - it cannot foresee the future. If it's momentarily more effective to destroy tropical rainforests for cooking oil and to develop the GMO for the compensation of its adverse effects, then the free market society will just do it with no mercy. I've seen this done with a gun which fires the DNA into the cell. It's a bit hit or miss. At least this isn't like that whole, "Eel Growth hormones in the Salmon" thing. There's little evidence that food additives are causing heart disease, diabetes or cancer but lots of evidence that Ancel Keys' cholesterol theory misled a generation or two of medical research such that the nasty effects of processed carbohydrates (buns, fries and soda) are still maverick ideas.